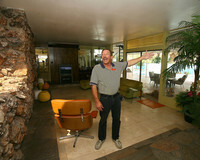 LeVine himself lives and works in a 1954 custom home at the end of a cul-de-sac near Oakey Boulevard, in a neighborhood he calls the epitome of the mid-century modern style. “A lot of people in Las Vegas don’t even know the term, let alone that they live in it,” LeVine said. He said it’s part of his mission to change that. On a short tour he points out the sharp lines of flat roofs with overlapping eaves and exposed beams he said typify the modernist architectural style popular between the late 1940s and early 1960s. “They were really designed for the desert,” said LeVine. Designed for the desert and “destined to come back as fabulous housing stock,” he added. In the John S. Park historic neighborhood where he lives, there are pre-war ranch houses, tract houses built for the first men stationed at Nellis Air Force Base. There are “Cinderella ranches” with their delicate molding and tiki houses with swooping roofs and outcroppings that look like the prows of Polynesian ships. The area is full of the exposed natural stone work, wide awnings and triangular windows near the ceilings that have returned to vogue. The idea in mid-century modern’s day was to make houses light and airy with giant windows — “bringing the outdoors in and letting the indoors out,” as LeVine put it. While showing one house, LeVine points out the hardwood floors. It’s built on a crawl space, making such a feature possible, and also has a swamp cooler and a space heater set into it. He tries to advise sellers to preserve such original elements whenever they can. Next door, there is a Dumpster bespeaking in-progress renovations. Whenever LeVine spots a new Dumpster, he takes a picture and puts it up on his blog. He blogs everything he finds at www.veryvintagevegas.com and brands the business VeryVintageVegas.com. “The whole thing is done off the blog,” he said. He started the blog about six months ago as a way to market himself, blogging about chimneys and decorative concrete blocks. He said he’s identified 37 kinds of the lacy masonry. For the last few decades these were just old houses with outdated, tacky designs. When LeVine’s mom moved to Las Vegas in 1975, her Realtor apologized for all the flat roofs in the neighborhoods he was showing her and she eventually settled in a new house on the edge of town. But that perspective is starting to change — due in no small part to nostalgia. “Some of it’s baby boomers going back to what they grew up in,” LeVine said. The neighborhoods themselves are a subject of renewed interest. Marycrest — which contains the home Liberace built for his mother — was very run down 10 years ago, LeVine said, except for 15th Street. Restoration has been spreading block-by-block from 15th Street. He called it the anchor street. “Without the anchor streets, I’d have never been able to get people to move back down here,” he said. He said the people who come to him to buy houses range from “middle-class people interested in an urban lifestyle,” to people who just don’t want to drive for an hour to get to work. That’s one of LeVine’s big selling points. He described an urban professional community and lifestyle burgeoning in the area. The blog doesn’t just promote real estate, it also features pictures from First Friday and other events downtown. “Everyone works, hangs out and parties within three miles of here,” he said. “This is re-gentrification at its best,” he said and asserted that Las Vegas was the last city in the country not to have the oldest part of town remade into an exciting, but pricey, place to live. As always, first artists and bohemian types moved in and started fixing up the inexpensive properties. Now, LeVine said, the college professors and young doctors and lawyers are starting to move in. “They’re coming here because of what these houses are, not because they’re cheap houses anymore,” he said. At the moment, houses in the historic district start at $275,000 and go up to $600,000. In Huntridge and Charleston Park, some houses go for $200,000, but they can go up to $600,000 or more. And they’re going to get more expensive. “They will be too expensive for a lot of people,” he said, predicting that soon, buyers will gladly pay more for two bedrooms and one bath in an old cottage downtown than they would for four bedrooms and two baths in a new place in the suburbs. They’ll pay, he said, for the location or the charm or to be a part of the neighborhood. It’s not for everyone. There’s no compulsory homeowner’s association, just a voluntary neighborhood association. And the neighborhoods are a mixed-bag of old and new houses, big and little ones — which is not to every prospective buyer’s taste. As for the sellers LeVine works with, many of them are on the same page as he is. For instance, LeVine and his right-hand man and mortgage specialist, Steve Christmas, often work with a couple who restore vintage homes with modern fixtures. He said there are a few neighborhoods that remain undiscovered, such as the “mini-mods” — some of the first Pardee homes — along St. Louis Avenue in the shadow of the Stratosphere. He’d like to see people move in to them, too — and fix them up and then get their neighbors to fix theirs up. Sure, the area could go out of fashion, but LeVine predicts that for the next 10 years at least it’s the old neighborhood’s turn. Jennifer Chambless, a teacher who has lived in Las Vegas for nine years, has no interest in the new neighborhoods. The houses are small, they all look the same and she would have to drive an hour to work. “To me, it’s just not interesting enough. I mean, I live in Las Vegas,” she said. She just moved into a house in LeVine’s cul-de-sac and seems intent on staying. “I like that there’s not a PetSmart on the corner,” she said. For more information on VeryVintageVegas.com, call 378-7055 or go to www.veryvintagevegas.com. The Downtown View is a newly published version of the Review Journal’s neighborhood local weekly. You can read the original article: Here, as well as the rest of the View! We’re very excited & happy about finally having our own View, and not just because Beverly wrote an amazing article on us. (we think she’s a great reporter all around) Big thanks go out to Beverly Bryan and her photographer Jim Miller for a wonderful story on us & for everything they’re doing to make Downtown a better place to live, work & play!